Morocco is an extremely sophisticated country. With its cuisine, artisans, culture and very refined architecture it’s no wonder Marrakech makes such a strong impression on visitors. The Jardin Majorelle is a dream of bold colors and lush greenery. Deep blues, yellow and mint greens provide a contrast to the over 300 species of plants. Yves Saint Laurent and Pierre Bergé discovered the Jardin Majorelle in 1966, during their first stay in Marrakech and later purchased the gardens in 1980, to restore the park to a glorious and colorful space with a museum dedicated to Berber culture in the original painter’s studio. Bring your camera and take your time, don’t rush through the garden. The Jardin Majorelle is a place for contemplation, relax, pleasure and, not least, inspiration if you need to refill your creative jar. Try to go early in the morning before the place gets too crowded and do not forget to visit the Berber Museum in the middle of the garden. This collection of jewelry and textiles from the Berber culture is Yves Saint Laurent and Pierre Berge’s private collection and is exhibited in Majorelle’s former studio. The Curated Cool: The new Yves Saint Laurent Museum Built of terracotta, concrete and an earthen coloured terrazzo with Moroccan stone fragments, the building blends harmoniously with its surroundings. See how the landscape and culture of Morocco inspired one of the most prolific fashion designers of our time. Probably the most photogenic place in Marrakech. 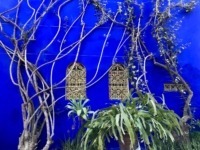 If you are in Marrakech, you have to visit “Le Jardin & the YSL Museum“!